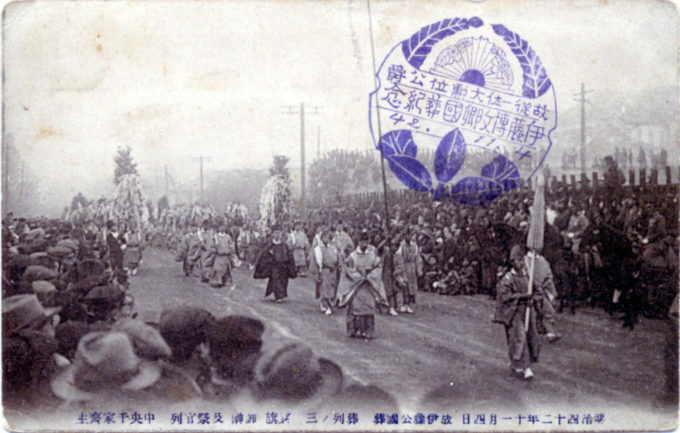 Prince Ito Hirobumi’s funeral procession, Nov. 4, 1909. Ito was revered in Japan as father of the first constitution and its parliamentary democracy. But, he was despised in Korea as the personification of Japan’s colonial imperialism of the Korean peninsula in Ito’s role as the colony’s first administrator-general. Ito was assassinated at Harbin, Manchuria, by a Korean nationalist patriot, An Chung-gun, on Oct. 26, 1909. “The establishment of the protectorate [in 1905, after Japan’s defeat of Russia] placed Korea in much the same relation to Japan that Egypt bore to England when the latter intervened in the Nile country in 1882. Japan could no more take the risk of another power gaining a foothold in Korea, and thereby threatening her causeway to the Asian mainland, than England could take the risk of another power gaining a foothold in Egypt, and threatening her sea-road to India. “… England sent to Egypt, as proconsul, her greatest administrator, Evelyn Baring, later Lord Cromer. Japan sent to Korea her greatest administrator, Marquis Ito. Each was confronted with the same problem: to reform a government rotten to the very core, and to effect the regeneration of a people reduced to the lowest depths of misery and degradation be centuries of spoliation and oppression. “Had Ito not fallen by the bullet of a Korean assassin, at the very moment when the patient, tactful, sympathetic administration which he had established was beginning to show results, there is little doubt that he would have met with an astonishing success in rehabilitation the Land of the Morning Calm as Cromer did in the Land of the Valley of the Nile. 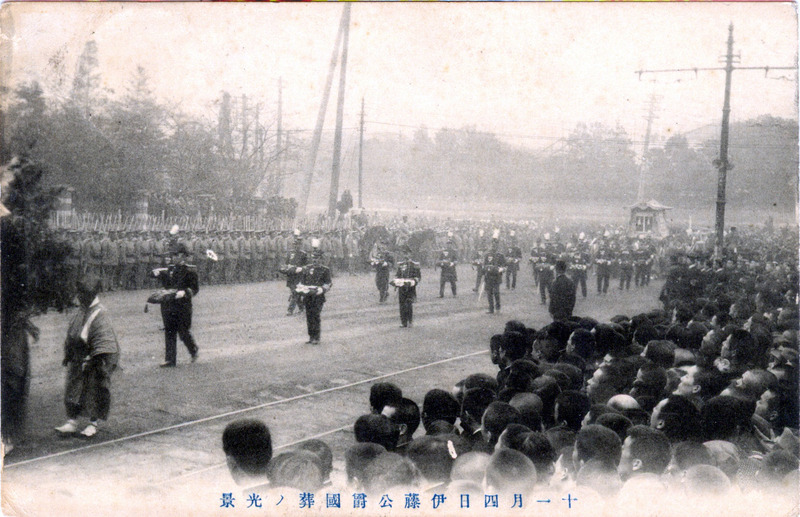 State funeral of Prince Itō Hirobumi, 1909. “Itō’s foreign policy was ambitious. He strengthened diplomatic ties with Western powers including Germany, the United States and especially the United Kingdom. In Asia he oversaw the First Sino-Japanese War and negotiated Chinese surrender on terms aggressively favourable to Japan, including the annexation of Taiwan and the release of Korea from the tribute system. “The Japan–Korea Treaty of 1905 made Itō the first Japanese Resident-General of Korea. He initially supported the sovereignty of the indigenous Joseon monarchy as a protectorate under Japan, but he eventually accepted and agreed with the increasingly powerful Imperial Japanese Army, which favoured the total annexation of Korea, resigning his position as Resident-General and taking a new position as the President of the Privy Council of Japan in 1909. Four months later, arriving at the Harbin Railway Station for a meeting with Vladimir Kokovtsov, a Russian representative in Manchuria, Itō was assassinated by Korean nationalist An Jung-geun. “Korea would be forcibly annexed by Japan in 1910, the year following Ito’s assassination.